This year we feature 5 Pre-Conference Workshops on June 29. These were created with the small business owner in mind. Separate registration required for access to workshops. Click the title below to read the speaker bios and workshop description. 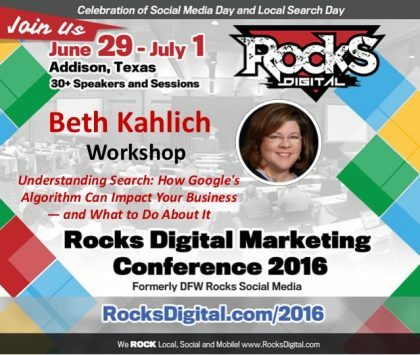 Join us at #RocksDigital 2016 in Addison, Texas for Beth Kahlich’s Workshop "Understanding Search: How Google's SEO Algorithm Can Impact Your Business — and What to Do About It" on June 29th. 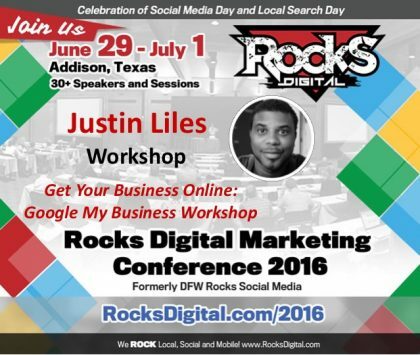 Join us at #RocksDigital 2016 in Addison, Texas for Justin Liles’s Workshop "Get Your Business Online: Google My Business" on June 29th. Join us at #RocksDigital 2016 in Addison, Texas for Brian Sullivan’s Workshop "Speaking in Small Rooms with Confidence on June 29th. Join us at #RocksDigital 2016 in Addison, Texas for Byron Ingraham’s Workshop "Discover Your Ideal Client" on June 29th.